Definition: The system which is used for providing the necessary field current to the rotor winding of the synchronous machine, such type of system is called an excitation system. In other words, excitation system is defined as the system which is used for the production of the flux by passing current in the field winding. The main requirement of an excitation system is reliability under all conditions of service, a simplicity of control, ease of maintenance, stability and fast transient response. The amount of excitation required depends on the load current, load power factor and speed of the machine. The more excitation is needed in the system when the load current is large, the speed is less, and the power factor of the system becomes lagging. The excitation system is the single unit in which the each alternator has its exciter in the form of generator. The centralised excitation system has two or more exciter which feeds the bus-bar. The centralised system is very cheap, but the fault in the system adversely affects the alternators in the power plant. Their types are explained below in details. 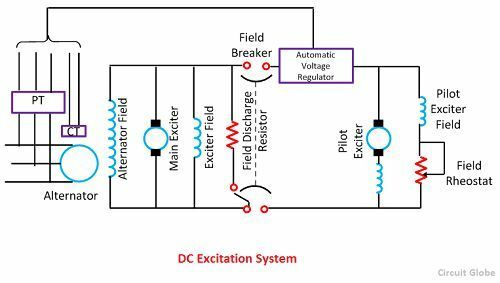 The DC excitation system has two exciters – the main exciter and a pilot exciter. The exciter output is adjusted by an automatic voltage regulator (AVR) for controlling the output terminal voltage of the alternator. The current transformer input to the AVR ensures limiting of the alternator current during a fault. When the field breaker is open, the field discharge resistor is connected across the field winding so as to dissipate the stored energy in the field winding which is highly inductive. The main and the pilot exciters can be driven either by the main shaft or separately driven by the motor. Direct driven exciters are usually preferred as these preserve the unit system of operation, and the excitation is not excited by external disturbances. The voltage rating of the main exciter is about 400 V, and its capacity is about 0.5% of the capacity of the alternator. 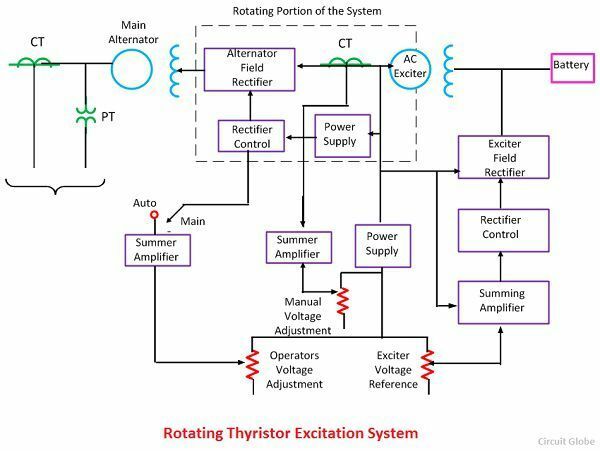 Troubles in the exciters of turbo alternator are quite frequent because of their high speed and as such separate motor driven exciters are provided as standby exciter. The AC excitation system consists of an alternator and thyristor rectifier bridge directly connected to the main alternator shaft. The main exciter may either be self-excited or separately excited. 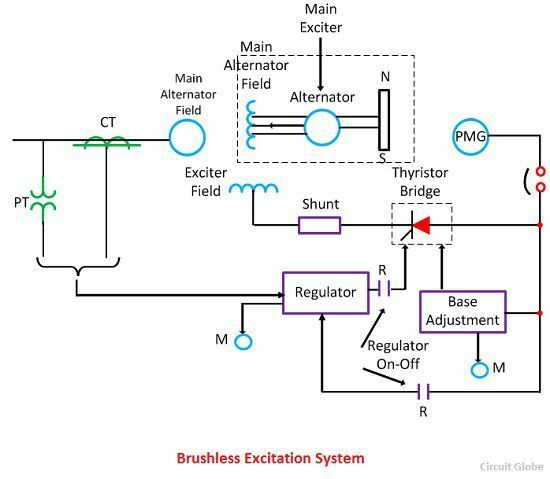 The AC excitation system may be broadly classified into two categories which are explained below in details. The rotor excitation system is shown in the figure below. The rotating portion is being enclosed by the dashed line. 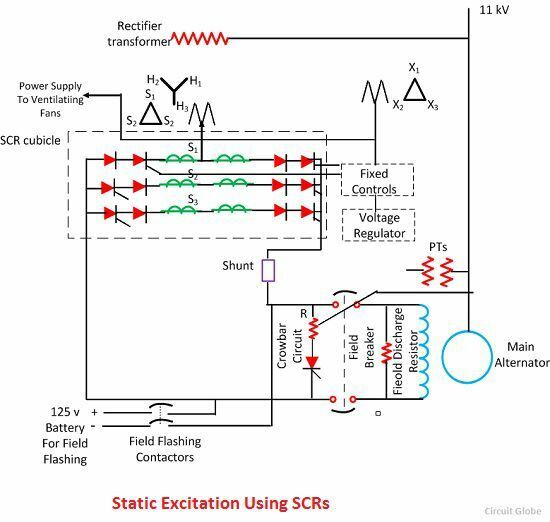 This system consists an AC exciter, stationary field and a rotating armature. The output of the exciter is rectified by a full wave thyristor bridge rectifier circuit and is supplied to the main alternator field winding. The alternator field winding is also supplied through another rectifier circuit. The exciter voltage can be built up by using it residual flux. The power supply and rectifier control generate the controlled triggering signal. The alternator voltage signal is averaged and compare directly with the operator voltage adjustment in the auto mode of operation. In the manual mode of operation, the excitation current of the alternator is compared with a separate manual voltage adjustment. This system is shown in the figure below. The rotating portion being enclosed by a dashed line rectangle. The brushless excitation system consists an alternator, rectifier, main exciter and a permanent magnet generator alternator. The main and the pilot exciter are driven by the main shaft. The main exciter has a stationary field and a rotating armature directly connected, through the silicon rectifiers to the field of the main alternators. The pilot exciter is the shaft driven permanent magnet generator having rotating permanent magnets attached to the shaft and a three phase stationary armature, which feeds the main exciter field through silicon rectifiers, in the field of the main alternator. The pilot exciter is a shaft driven permanent magnetic generator having rotating permanent magnets attached to the shaft and a 3-phase stationary armature, which feeds the main’s exciter through 3-phase full wave phase controlled thyristor bridges. The system eliminates the use of a commutator, collector and brushes have a short time constant and a response time of fewer than 0.1 seconds. The short time constant has the advantage in improved small signal dynamic performance and facilitates the application of supplementary power system stabilising signals. In this system, the supply is taken from the alternator itself through a 3-phase star/delta connected step-down transformer. The primary of the transformer is connected to the alternator bus and their secondary supplies power to the rectifier and also feed power to the grid control circuit and other electrical equipment. This system has a very small response time and provides excellent dynamic performance. This system reduced the operating cost by eliminating the exciter windage loss and winding maintenance. Every definition, comparison, circuit diagram are best, and answer is also best. I have a doubt that how much amount of voltage generated and when generated. When the field flashing contactor on for flashing input volt to the circuit.